선암사석가모니괘불탱은 본존불만을 단독으로 등장시켜 간단한 구성을 보여주는 독존도(獨尊圖) 형식의 괘불화이다. 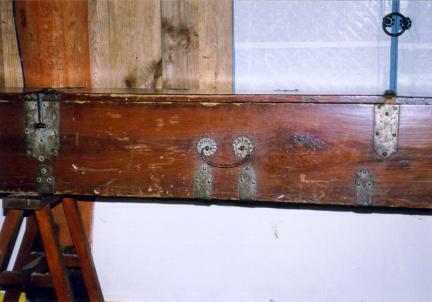 중앙에 홍련좌(紅蓮座)를 딛고 서 있는 입불상을 화면에 가득 차도록 큼직하게 그린 다음 상단 좌측(向右)에는 구슬장식이 화려한 금색 탑안에 사자좌를 한 ＇다보불(多寶佛)＇추정의 불상이 앉아 있고, 밖에는 부처를 향해 합장한 보살상(대요설보살로 추정)이 배치되어있는 장면을 나타내었다. 이와 대칭하여 자리한 오른쪽(向左)에는 사자좌에 앉아 각자 손 모양을 달리하고 있는 ＇시방불(十方佛)＇을 묘사하였다. 거의 손상 없이 원형을 잘 유지하고 있는 괘불함은 전·후·좌·우 14곳에 손잡이용 고리가 달려 있으며, 궤의 각 모서리에는 어문(魚文)과 연화문(蓮花文), 나비무늬 등이 투각된 금속 장석을 장식하였다. 복장유물은 황동제 후령통 1조와 감지주서(紺紙朱書) 발원문 1매 및 백지묵서(白紙墨書) 9매, 백지주서 및 인본(白紙朱書 및 印本) 다라니 9매 등으로, 비교적 현상이 양호한 편이다. 선암사 괘불탱은 조성연대가 명확하여 화원인 ＇쾌윤(快允)＇작품의 초기 경향과 함께 조선시대 18세기 중엽 경 불화 화단의 흐름을 살피는데 자료적 가치가 있음은 물론, 알맞은 신체 비례에 유려하면서도 정밀한 필치로 이목구비와 손·발을 묘사하고 꽃무늬들을 나타냄으로써 세련미가 돋보이는 등 조형성 또한 뛰어나다. 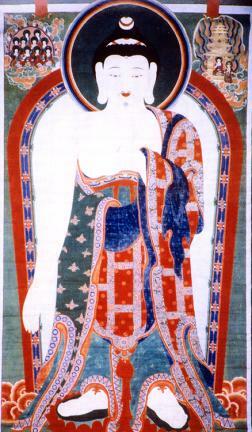 This hanging painting of Sakyamuni Buddha is in the style of a dokjondo (painting of a single Buddhist figure). Its composition is simple, with the main Buddha standing alone on a red lotus flower pedestal, filling the entire canvas. In the top left section of the painting, a Buddhist figure, presumed to be Prabhutaratna Buddha, sits on a lion pedestal inside a gold pagoda elaborately adorned with bead decorations. Outside the pagoda is a Bodhisattva, presumed to be Daeyoseolbosal Bodhisattva, facing the Buddha with his hands in a hapjang (a gesture in which the palms of both hands are clasped together in front of the chest as a sign of reverence). Symmetrical to this, in the top right section, are ten Sibangbul (Buddhas in ten directions) seated on lion pedestals, each displaying a different hand gesture. 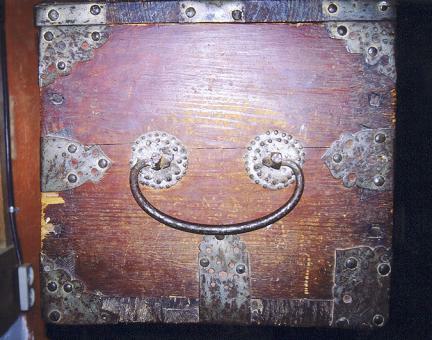 The Gwaebul Chest for storing the painting has been preserved in good condition. It has fourteen lifting handles on the front and back, left and right sides, and metal corner ornaments in the shape of fish, lotus flowers and butterflies in openwork designs. 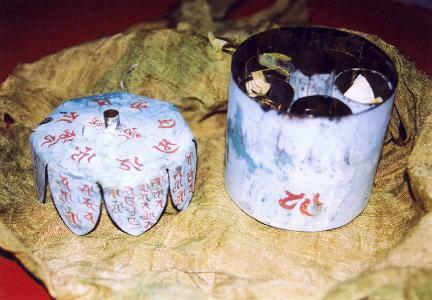 Other relics that were found together with the painting include a brass huryeongtong (storage case), text of prayers in red ink on indigo paper (one sheet) and in Chinese ink on white paper (nine sheets), and Daranigyeong (Dharani Sutra) in red ink on white paper and in print (nine sheets). All of the relics are in good condition. The painting is a valuable piece for the study of the early artistic styles of Kwaeyun, the main court artist who participated in the production of this painting, and the artistic trends of Buddhist artists of the mid-18th century Joseon Dynasty. It is also an outstanding work of art displaying elegant and intricate brushwork in the figure’s facial features, hands and feet, and floral patterns.